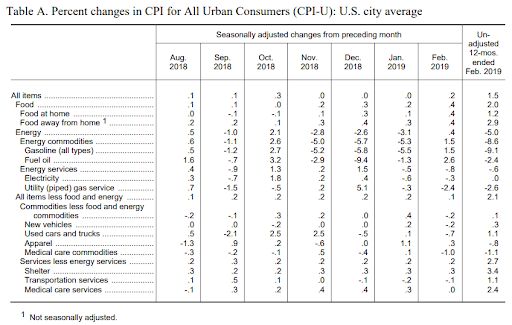 Headline consumer price inflation has now slowed for 6 of the last 7 months and dropped to just +1.5% YoY - the weakest since September 2016, amid falling prices for autos and prescription drugs. 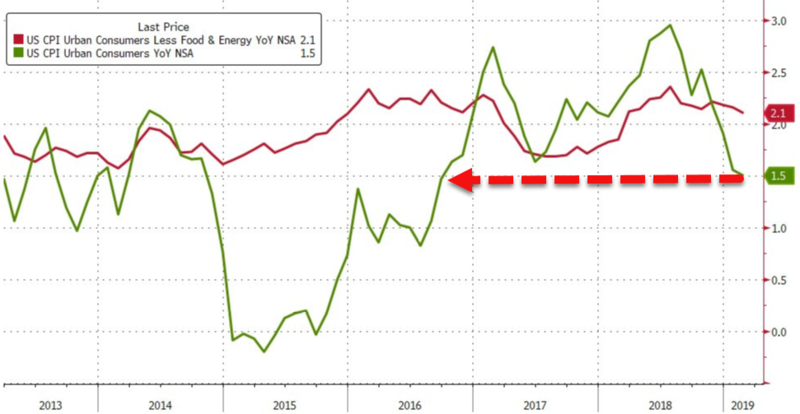 Core CPI also slipped once again to its weakest since Feb 2018. 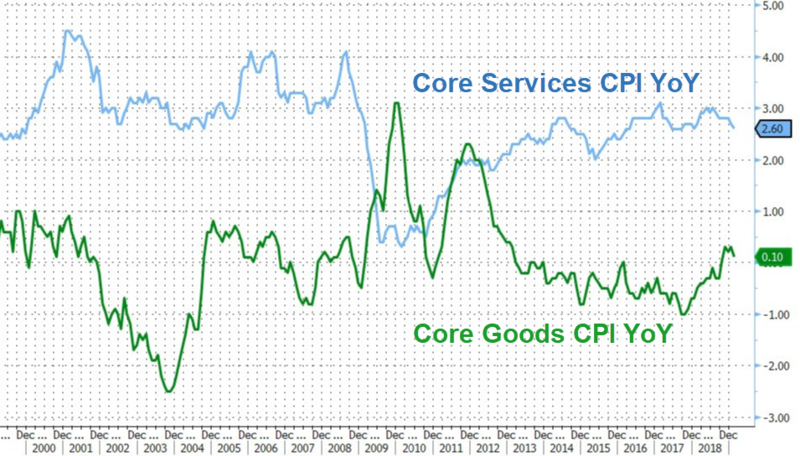 Both headline and core CPI printed below expectations. The index for all items less food and energy increased 0.1 percent in February, its smallest monthly increase since August 2018. 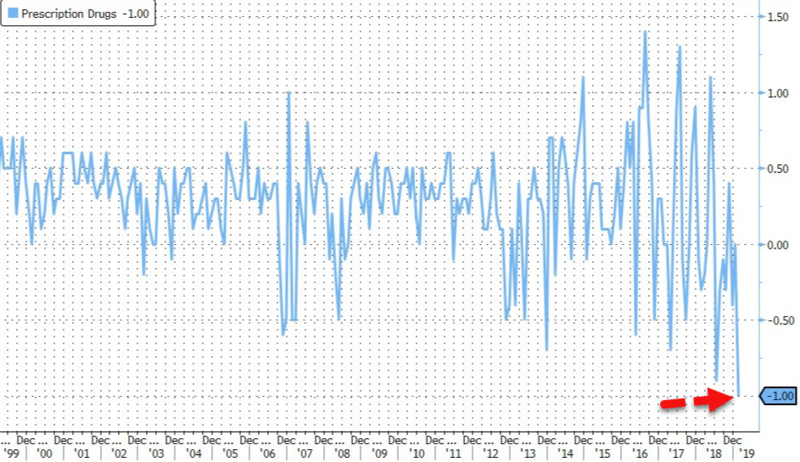 The index for personal care increased 0.6 percent in February, its largest monthly increase since April 2018. The apparel index, which rose 1.1 percent in January, increased 0.3 percent in February. The education index increased 0.3 percent, and the indexes for household furnishings and operations, airline fares, tobacco, motor vehicle insurance, and alcoholic beverages also rose in February. The medical care index declined in February, falling 0.2 percent after rising in each of the five previous months. Prescription-drug prices fell 1 percent on a monthly basis, the most on record, bringing the annual decline to 1.2 percent -- the largest drop since 1972. The recreation index declined in February, falling 0.4 percent after rising 0.3 percent in January. The index for used cars and trucks fell 0.7 percent, and the index for new vehicles declined 0.2 percent; both indexes increased the prior month. Finally, the shelter index increased 0.3 percent in February for the fourth consecutive month. The indexes for rent and owners' equivalent rent both rose 0.3 percent, and the index for lodging away from home increased 1.3 percent. The shelter index rose 3.4 percent over the last 12 months, a larger increase than the 3.2-percent increase for the 12 months ending January. 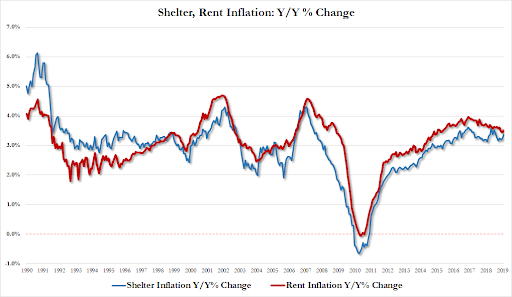 Of course, this is exactly what The Fed wants to see - slowing inflation enabling their "patient" outlook. “With nothing in the outlook demanding an immediate policy response and particularly given muted inflation pressures, the committee has adopted a patient, wait-and-see approach,’’ Fed Chair Powell said in a speech in California. Responding to questions, Powell said inflation in the U.S. is low, stable and doesn’t react much to slack in the economy.